Recent years have seen numerous sociological disagreements devolve into heated debates, with scholars openly accusing their peers of being both empirically wrong and morally misguided. While social scientists routinely reflect on the ethical implications of certain research assumptions and data collection methods, the sociology of knowledge production has said little about how moral debates over scholarship shape subsequent research trajectories. Drawing on the new French pragmatic sociology, this article examines how sociologists respond to criticisms of the moral worth of their research. The article outlines three typical responses: (1) accepting the criticism and changing direction completely; (2) accepting the criticism but changing discursive framing to incorporate existing research without being subject to critique; and (3) navigating through the debate by devising new research directions that do not trigger such criticism. To demonstrate, the article looks at how sociologists of religion responded, in their published scholarship, to criticisms of secularization theory as depreciating religious people and spiritual experience. Across the responses, we show that sociologists have included moral considerations in their empirical investigations, and have switched among several diverse moral justifications to address—and also avoid—criticism. We conclude by demonstrating that this model can be extended to other domains of sociological inquiry, including the study of gender-based wage inequality and methodological nationalism. The article highlights the importance of mapping the moral frameworks sociologists use for the sociology of knowledge and the sociology of morality. The authors contributed equally to this article and are listed alphabetically. The authors are indebted to Jeffrey C. Alexander, Ron Jacobs, Michèle Lamont, Ann Mische, Margarita Mooney, Philip Smith, and Eleanor Townsley for invaluable feedback on this project. The authors also thank Matthew A. Andersson, Thomas Lyttleton, and Candas Pinar for their comments on previous versions of this article. 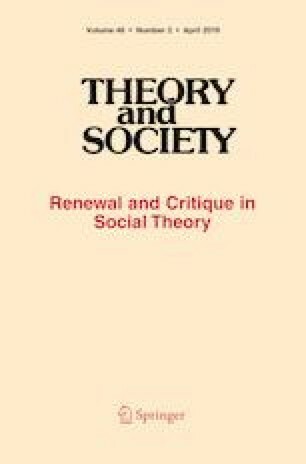 Finally, the authors thank the Editors and reviewers at Theory & Society whose input has greatly improved the final article. Holbraad, M., Morten, A. P., & Viveiros de Castro, E. (2014). The politics of ontology: Anthropological positions. Cultural Anthropology website: https://culanth.org/fieldsights/462-the-politics-of-ontology-anthropological-positions. Accessed 13 Feb 2019.